Mold remediation is not simply a matter of cleaning the visible mold that has infested damp wood or drywall. Mold spores are everywhere, inside and outside, but they merely float through the air if they don’t have water and organic material to help them form destructive colonies. To properly handle a mold problem, you must also deal with the water problem, and that’s where Archer Restoration Services excels. Mold remediation often requires removal and replacement of existing structures that are too deeply infested to save. But because Archer is a full-service mold removal and restoration company, you won’t need to hire another contractor to complete the job – we restore, as well as remediate. 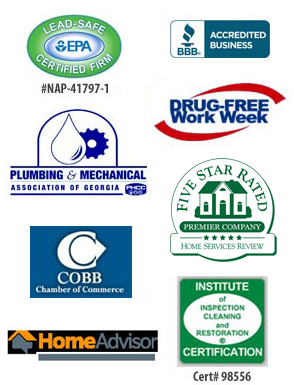 Archer’s residential and commercial mold remediation specialists have more than 50 years’ combined experience in the restoration business, and we carry an A-plus rating with the Better Business Bureau. Contact Archer for complete resolution of your mold problem in Woodstock, Norcross, Lawrenceville, Canton, Stone Mountain, Sandy Springs and elsewhere in Metro Atlanta.